Kevin Ashton led pioneering work on RFID (radio frequency identification) networks, for which he coined the term the Internet of Things, and cofounded the Auto-ID Center at MIT.His writing about innovation and technology has appeared in "Quartz," "Medium," "The Atlantic," and "The New York Times."" "Ashton takes on creation's most pernicious cliches. Great ideas don't come as sudden gifts, he says. Creation is a grueling process, one that involves long nights, missteps and building slowly on what's come before. To make his case, he sifts through social science and history to debunk the aha stories behind the creation of the iPhone, the discovery of a popular cancer cure and the magic of Woody Allen's humor ... Being a genius is hard work. But that spark is in all of us." "[An] entertaining and inspiring meditation on the nature of creative innovation ... Fans of Malcolm Gladwell and Stephen Levitt will enjoy Ashton s hybrid nonfiction style, which builds a compelling cultural treatise from a coalescence of engaging anecdotes." "Ashton wastes no time debunking the creativity myth ... Taken collectively, the creations documented in this thought-provoking book prove that creative power resides in us all." ""Ashton makes compelling arguments about creativity and genius." "An inspiring vision of creativity that's littered with practical advice, and isa cracking read to boot." 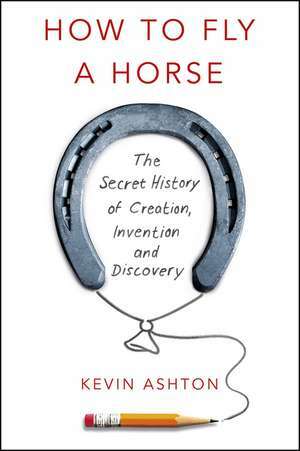 ""How to Fly a Horse" provides plenty of insight into how people create but, at the same time, systematically dismantles the myth of creative genius. We can all create. If we put in the time and effort. Ashton illustrates his thesis with a series of aptly-chosen and engaging stories ranging from how the Wright brothers mastered aviation (a problem they thought of in terms of learning to fly a horse) to a behind-the-scenes look at how Trey Parker and Matt Stone come up with their ideas for South Park. The book is an entertaining and enlightening romp through creation, invention and discovery ... If you want to tap your creative potential, buy this book. It s the last one you ll ever need to read." If you have ever wondered what it takes to create something, read this inspiring and insightful book. Using examples ranging from Mozart to the Muppets, Kevin Ashton shows how to tap the creative abilities that lurk in us all.There are no secrets, no shortcuts; just ordinary steps we can all take to bring something new into the world. Ashton s message isdirect and hopeful: creativity isn t just for geniuses it s for everybody. Joseph T. Hallinan, author of "Why We Make Mistakes"
"Kevin Ashton has built and sold startups, launched game-changing innovations inside big companies, and shaped our understanding of the Internet of Things. But this may be his greatest achievement yet one of the most creative books on creativity I have ever read, a genuinely inspiring journey through the worlds of art, science, business and culture that will forever change how you think about where new ideas come from." William C. Taylor, cofounder and editorof "Fast Company" and author of "Practically Radical"
A detailed and persuasive argument for how creativity actually works not through magical bursts of inspiration but with careful thought, dogged problem-solving, and hard-won insight. Ashton draws on a wealth of illuminating and entertaining stories from the annals of business, science, and the arts to show how any of us can apply this process to our own work. Mason Currey, author of "Daily Rituals: How Artists Work"
Ashton s beautifully written exploration of creativity explodes so many myths and opens so many doors that readers, like me, will be left reeling with possibilities.We can all create, we can all innovate.Move over, Malcolm Gladwell; Ashton has done you one better. Larry Downes, author of the "New York Times" bestseller "Unleashing the Killer App" and co-author of "Big Bang Disruption"
If you consider yourself a curious person then you will love this book. Ashton shares so many delightful stories of where things come from and how things came to be, I seriously believe that it will make anyone who reads it smarter. Simon Sinek, "New York Times" bestselling author of "Start With Why" and "Leaders Eat Last"
"How to Fly a Horse "solves the mysteries of invention. Kevin Ashton, the innovator who coined the internet of things, shows that creativity is more often the result of ordinary steps than extraordinary leaps. With engrossing stories, provocative studies, and lucid writing, this book is not to be missed. Adam Grant, professor of management at the Wharton School and "New York Times "bestselling author of "Give and Take"""
"How to Fly a Horse" gallops past dozens of fascinating stories and experiments on the way to presenting a radical new answer to the question of where creative ideas begin. If you ve ever struggled to produce new ideas while imagining that to some lucky people they come easily, you must read this book. Adam Alter, author of "Drunk Tank Pink: And Other Unexpected Forces That Shape How We Think, Feel, and Behave"
Ashton gleefully demolishes the mystery of innovation and delivers a vision that is at once optimistic and immensely practical. Creativity is not the exclusive domain of brainiac elites; it is what defines us as humans. This book will forever change how you think about innovation and will make you a better, more creative innovator. Kevin Ashton's new book "How to Fly a Horse" is all about the creative sorcery and motivational magic necessary to make impossible things happen in teams or as individuals. Through numerous examples of creative genius ranging from Einstein to the creators of South Park to the invention of jet planes and concertos, Ashton reveals the secrets of the great scientists, artists, and industrialists of the last few centuries. John Maeda, author of "The Laws of Simplicity" and founder of the SIMPLICITY Consortium at the MIT Media Lab"
Entertaining. . . . [E]nlightening. . . . Might be the genre s be all and end all. . . . If you want to tap your creative potential, buy this book. It s the last one you ll ever need to read. One of the most creative books on creativity I have ever read, a genuinely inspiring journey through the worlds of art, science, business and culture that will forever change how you think about where new ideas come from. [Ashton s] is a democratic idea a scientific version of the American dream. . . . [A]n approachable, thought-provoking book that encourages everyone to be the best they can be. ["How to Fly a Horse"] takes on creation s most pernicious cliches. . . . [Ashton] arrives at his theories by dint of his own hard work. . . . Being a genius is hard work. But that spark is in all of us. An inspiring vision of creativity that s littered with practical advice, and isa cracking read to boot. [An] entertaining and inspiring meditation on the nature of creative innovation... Fans of Malcolm Gladwell and Stephen Levitt will enjoy Ashton s hybrid nonfiction style, which builds a compelling cultural treatise from a coalescence of engaging anecdotes. Adam Grant, professor of management at the Wharton School and "New York Times "bestselling author of "Give and Take"
Kevin Ashton s new book "How to Fly a Horse" is all about the creative sorcery and motivational magic necessary to make impossible things happen in teams or as individuals. Through numerous examples of creative genius ranging from Einstein to the creators of South Park to the invention of jet planes and concertos, Ashton reveals the secrets of the great scientists, artists, and industrialists of the last few centuries.